This compact, diagnosis-speeding guide has virtually defined the field of dermatology for thousands of physicians, dermatology residents, and medical students across the globe. Spanning the entire spectrum of skin problems, it combines laser-precise color images of skin lesions with a concise summary outline of dermatologic disorders, along with the cutaneous signs of systemic disease. A color-coded 4-part organization facilitates review at a glance and features helpful icons denoting the incidence and morbidity of disease. Derived from Fitzpatrick's Color Atlas and Synopsis of Clinical Dermatology, these flashcards represent 150 of the most commonly seen dermatologic problems and 100 rare or challenging cases. Each image includes diagnosis, clinical manifestation, differential diagnosis, diagnosis, and management. Generations of clinicians, skin biologists, residents, and educators have acclaimed Fitzpatrick’s as the most authoritative and complete guide to dermatologic basic sciences, histopathology, diagnosis, and treatment. Edition after edition, it reflects the latest insights into skin diseases and skin biology—and their practical relevance to general internal medicine—while covering the scientific foundations of the specialty. Quickly and confidently evaluate and diagnose skin biopsies with Practical Dermatopathology. Written from the perspective of both the histopathologist and clinician, this popular medical reference allows you to search by disease or pathologic feature to quickly locate key criteria and a differential diagnosis. Practical and portable, Practical Dermatopathology is your ideal high-yield microscope companion! Make accurate, complete reports by fully understanding clinical correlations. Accurately diagnose a wide range of conditions using over 700 full-color illustrations, with leader lines pointing out key pathologic and clinical features as they would be seen in daily practice. Find critical information quickly through extensive cross-referencing of differential diagnosis lists by finding and disease. Clinical lists are based on location, symptoms, duration, arrangement, morphology, and color. Pathologic lists include major categories such as epidermal changes, dermal changes, and cell types. Gauge your mastery of the material with online multiple-choice review questions that provide an ideal study resource for board review or recertification. Stay current with comprehensive updates throughout that include the latest advancements in the diagnosis of lymphoma as well as unique differential diagnosis lists, full-color pathology images, supporting clinical photographs, and multiple choice questions. Access the complete contents online - fully searchable, with downloadable image library, bonus clinical correlation images, review questions, and more, at www.expertconsult.com. Dermatology Essentials, edited by world authorities Drs. Jean L. Bolognia, Julie V. Schaffer, Karynne O. Duncan, and Christine J. Ko, provides the quick answers you need on every important aspect of dermatology and guidance on their application in your day-to-day practice. Derived from the renowned authoritative reference work Dermatology, 3rd Edition, this on-the-go reference distills the essential information needed to quickly diagnose and manage a wide range of dermatologic disorders-without the need for any additional resources. The unique format of the Dermatology DDX Deck gives you a completely portable, uniquely convenient diagnostic tool to compare potential diagnoses visually, side by side, without the need to flip back and forth between different pages. Each laminated card includes full-color images and information about a particular diagnosis, as well as cross references (DDx-refs) to other potential diagnoses. Bound at one corner and small enough to fit in a pocket, this is the perfect reference for those on the front line of dermatological diagnosis! 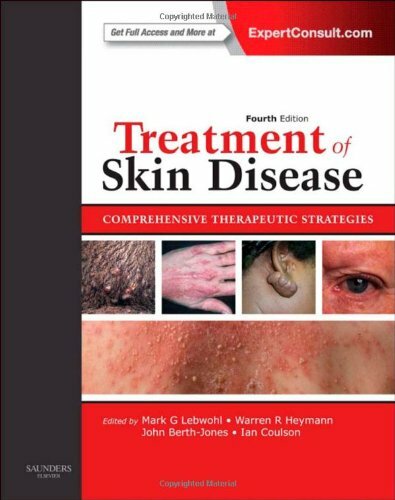 Skin Disease: Diagnosis and Treatment, 3rd Edition, by Drs. Thomas P. Habif, James L. Campbell, Jr., M. Shane Chapman, James G. H. Dinulos, and Kathryn A. Zug, is the quick and practical clinical reference you need to help you effectively diagnose and treat 250 common dermatologic diseases. You'll find succinct, user-friendly chapters arranged by disorder type, updated treatment plans, and hundreds of new images showing diseases in various stages of manifestation, including detailed information and illustrations on tropical dermatology. Perfect for any medical practitioner who'd rather treat than refer patients with skin disease, this full-color resource will also serve you well when prepping for the boards. Now in its 4th edition, Dr. du Vivier's bestselling Atlas of Clinical Dermatology provides the comprehensive visual guidance you need to effectively evaluate, diagnose, and manage all forms of skin disease.Over 2,300 images richly depict etiology, clinical features, diagnosis, and treatment, equipping you to provide the best care to every patient. Get complete guidance on etiology, clinical features, diagnosis, and treatment with Dr. du Vivier's Atlas of Clinical Dermatology. Compare dermatopathology images and their accompanying presentations and manifestations side by side through an oversized format that accommodates larger illustrations. Quickly find the answers to your most common clinical questions with help from a clear, consistent writing approach. Get well-rounded coverage of regional dermatology, dermatoses of infancy, pregnancy and management, HIV and AIDs, and immunosuppression and transplants. View each skin disease clearly with 2,300 full-color, high-quality images, including more dermatopathology specimens than ever before. Effectively diagnose patients of color with enhanced coverage of diverse skin types. Treatment of Skin Disease is your definitive source for managing the complete range of dermatologic conditions you're likely to encounter in practice. This medical reference book boasts an intuitive and easy to use format that covers the full spectrum of options, equipping you with not only standard treatment strategies, but second- and third-line therapies for instances when other alternatives fail. You'll be thoroughly prepared to offer your patients the expertly informed medical care they deserve when facingcommon or complex dermatologic diseases. Address your most difficult clinical challenges by having every possible therapy option at your disposal, including third- and fourth-line therapies, as well as standard treatments for dermatologic disorders. Apply the in-depth knowledge of leading dermatologists through a summary of each treatment strategy along with detailed discussions of treatment choices. Gain insight to the essential features which define each dermatologic disease with chapters presented in a tabular format, using checklists of diagnostic and investigative pearls and color-coded boxed text, for quick at-a-glance summaries of key details. Seamlessly search the full text online at Expert Consult. Make the most informed decisions possible with the inclusion of up-to-date evidence levels throughout the text. Stay abreast of emerging drug treatments and research with the very latest options for the 251 most common dermatologic conditions, and take advantage of today's expert knowledge on hot topics in dermatology such as bed bugs, erosive pustular dermatosis, polycystic ovary syndrome, and more. Achieve effective visual diagnoses by viewing over 250 full-color clinical images of skin diseases, most of which are brand new in this edition.